Learn tips to lift safely in the workplace. Manual materials handling (MMH) involves lifting, lowering, carrying, pushing, pulling or holding, and is the most common cause of occupational fatigue and low back pain. About three of every four Canadians whose job includes MMH suffer pain due to back injury at some time. Each year several thousand Canadian workers are permanently disabled by back injuries, while many others are unable to return to their former jobs. 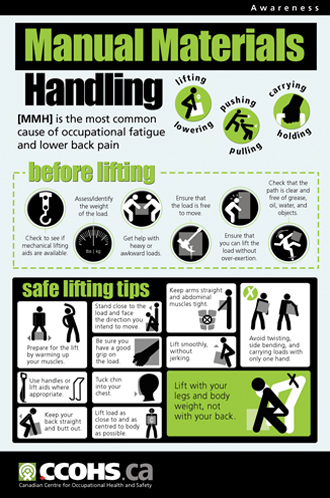 Display this poster filled with practical tips to help remind workers of how to lift and handle materials properly and safely in the workplace.